After the ignominious fall of Kwame Nkrumah from power, the notorious Preventive Detention Act, one of the legacies of that repressive era, was repealed. The thousands of prisoners still being held in prisons under that pernicious law were promptly released. There was jubilation throughout the country as those falsely imprisoned were able to return home to join their families. The atmosphere in the whole country was buoyant. It did not matter that some of the returning detainees were sick and infirm as a result of the long years of unlawful incarceration under horrendous conditions. There was hope that Ghana would chart a new course of freedom and justice after the end of Nkrumah’s dictatorship..
Those who today, do not revel in the repeal of the Preventive Detention Act, continue to say that it was the American Central Intelligence (C.I.A.) which rescued Ghanaians from dictatorship. If the C.I.A. was powerful enough to do this in far away Africa, one wonders why it could not overthrow the communist regime only 90 miles off the American shores in Cuba .It is difficult to understand why the C.I.A. would be given the credit for liberating us. It was the work of Ghanaians who had decided to risk their lives to resist the oppressor and throw off the yoke of oppression. The level of spontaneous approbation of Ghanaians in 1966 has not greeted any other change of regime in Ghana. The almighty Central Intelligence Agency is being given too much credit it does not deserve. More regrettably, these people of the neo-colonial mentality but professing Nkrumaism are indeed insulting the intelligence of the African, by saying that we would have sheepishly continued to endure oppression if some white American had not come to our rescue. Nkrumaism can indeed distort the African mentality! The first years after Kwame Nkrumah started with constitutional rule in which basic rights were respected. However, a legacy of Nkrumah’s megalomania resurfaced in a different form. By his denial of the people of Ghana the human and political right of the use of the ballot box to change our leaders, Kwame Nkrumah literally invited the Armed Forces and the Police to remove him from power. This was the inexorable coup d’etat of 1966. The sequel to this noble act of gallantry was that, the soldiers tasted civilian political power and became enticed by it. As a result, from 1966 to 1992, the military have repeatedly intervened to halt our experiment in democratic rule. The coup d’etat of the National Redemption Council in 1972, under Col. I. K. Archeampong, set the clock back. It was by definition undemocratic. However, the deep regret was that they did incalculable damage to the economy. It took a lot of courage to resist the attempt by Archeampong and his men to entrench themselves in military rule in Ghana by the invention of a new system with the strange nomenclature of Unigov. That would have been a system of government in which constitutional roles would be distinctly assigned to the Armed Forces, the Police and elected civilians. Interestingly, those who blame the American Central Intelligence Agency (C.I.A.) for everything in Ghana, have not blamed it for the resistance to the Unigov concept which would have accorded a constitutional recognition to the military as a permanent factor in our governance. After the Archeampong years, a brief period of civilian rule emerged in 1979. However Flight–Lieutenant Jeremiah John Rawlings and his military adventurers would not allow democracy to blossom. They ushered in the most sadistic and bloody era in Ghana’s political history. Kwame Nkrumah, in all his many years of repressive rule, did not shed the blood of his enemies by hanging or the firing squad. All this changed with Flt.-Lt. Jeremiah Rawlings and his Armed Forces Revolutionary Council (A.F.R.C.) in 1979, and later the Provisional National Defence Council (P.N.D.C.) in 1981. Adversaries were shot at the shooting range by firing squads. Naked women were openly flogged in public to the applause of the so-called revolutionaries. Kangaroo courts were instituted as a parallel system to the regular courts. These kangaroo courts would typically take less than five minutes for an accused person to be sentenced to death or long years of imprisonment. Often the judges in these courts were hooded to hide their identity. 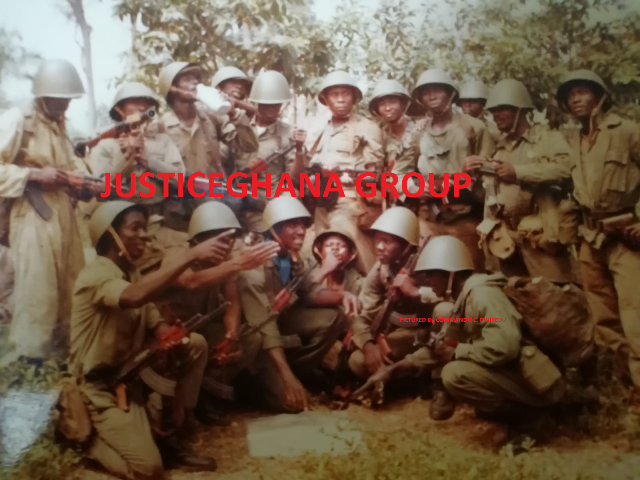 For almost twenty years, Ghanaians suffered this type of rough justice. Detention without trial was as rampant as in the Kwame Nkrumah regime. Regardless of the principled condemnation of this unconstitutional seizure of power, Flight-Lieutenant Rawlings has carved for himself a permanent niche as the most brutal ruler in the annals of Ghana. His were very bloody regimes in which many were brutally killed and many disappeared. In addition, countless citizens were incarcerated without trial but only by the fiat of Rawlings. It was a common spectacle to find the charred, partly burned or mutilated or dismembered bodies of persons who were abducted from their homes. These abductions occurred at night even when a dusk to dawn curfew was clamped on the whole nation and only security service personnel were permitted to be on the streets. To Rawlings and his Provisional National Defence Council, there was no concept known as human rights. The right to life and liberty, freedom of conscience, freedom of speech, and freedom of association were alien concepts to them. Even sitting Judges of the country’s High Court were abducted during state-imposed curfew hours form their homes, and cruelly murdered by operatives of the ruling junta. It was heretical and anathematic to broach such issues, and the reprisal was imprisonment or, predictably worse still, disappearance or assassination. Nkrumah, with all his repression, never resorted to political execution of his opponents. It took the deplorable deterioration of the economy and the consequential effect of international pressure for Jeremiah Rawlings to concede to return Ghana to constitutional rule. That decision was taken grudgingly. Quite apart from his disgraceful record in human rights, Rawlings had also ruined Ghana=s economy completely. Donor countries which had winked at the human rights abuses, including the executions and disappearances, began to insist on minimal standards of decency and public accountability. A combination of these forced the hand of Rawlings. The people of Ghana demanded a Constituent Assembly of elected representatives to draw up a new Constitution. Afraid that elected representatives might exercise the sovereignty of the people to produce a constitution to his dislike, Rawlings rejected that course of action. Instead, he created a Consultative Assembly, mainly consisting of his appointees, being those who had collaborated with him in brutalizing and looting the country. Furthermore, the body he constituted was only a AConsultative@ Assembly. It was merely advisory to Flight-Lieutenant J.J. Rawlings as Chairman of the Provisional National Defence Council. It had no legitimacy in its own right and was not expressive of the sovereign power of the people to establish a constitution by themselves and for themselves. It was this body that eventually produced the constitution which, as amended by Rawlings according to his sole judgment, became the 1992 Constitution, the Constitution of the Fourth Republic. Even with their sordid background, The Provisional National Defence Council (P.N.D.C.) handed over power to initiate civilian rule in 1992. Notwithstanding their bloody credentials, the P.N.D.C. and Jeremiah Rawlings crafted a fairly democratic constitution for civilian rule. Generally the 1992 Constitution has some good features. It created an executive President to be elected directly by universal adult suffrage. The President can choose some of his Cabinet Ministers from outside Parliament, but the majority of them must be Members of Parliament. Parliament itself is to be elected by individual constituencies on a majority of votes in each constituency. Proportional representation was rejected. An independent Judiciary was established as the third branch of government. The 1992 Constitution addressed human rights issues, as military dictators of the P.N.D.C could not be absolutely certain about who might succeed them. Perhaps it was an instinctive exercise in self-preservation, as the dictators wanted to insulate themselves against the arbitrariness, brutality and repression that had been their stock in trade. The new Constitution, therefore, contains very important restrictions on the exercise of executive power. It contains express provisions that guarantee the rights to life, liberty and property, freedoms of speech, conscience, association and political belief, and it provides for a free press. It proscribes the creation of a one-party state. How would “Osagyefo” Dr. Kwame Nkrumah think of this type of excessive liberalism in a multi-party democracy? He would loath to live in such democracy! The Consultative Assembly made some good proposals for the 1992 Constitution. However, as Rawlings regarded the draft proposals as merely advisory to him, he insisted on specific provisions to protect himself and his colleagues of the brutal and bloody dictatorship. These are innocuously hidden in a lengthy addendum to the approved text and referred to as ATransitional Provisions@. Normally, transitional provisions are by definition transitory and deal with interim matters arising out of the change from one regime to another. The Transitional Provisions of the Rawlings Constitution are, by contrast, permanent provisions written in concrete. While other parts, the operational parts of the Constitution, may be amended, the so-called ATransitional Provisions@ are so entrenched that amendments to them are virtually impossible. The so-called Transitional Provisions are to the effect that no court has jurisdiction to entertain any action, or make any decision or order, or grant any remedy or relief, in any proceedings against the Government of Ghana, or any person acting under the authority of the government, or against any person acting in concert or individually to assist or bring about the change of government by Rawlings and his collaborators on the 31st December, 1981, the date of the coup d=etat, in respect of any act or omission The result is that Rawlings remains totally unaccountable for the atrocious violations of human rights. Those innocent citizens who were murdered or executed, who simply disappeared, or who were brutalized, permanently maimed and scarred, or who spent long periods in prison without trial, cannot by themselves or through their personal representatives seek any remedy or relief. This was the high price at which Rawlings condescended to allow a return to civilian rule. It signals for future military coup plotters that they can commit human rights violations with impunity.